Body modification has gotten its hands on a squeamish tattoo trend which involves getting the eyeballs inked. It involves injecting the whites of your eyes with ink to make them look like coloured orbs. And Delhi-based Karan decided to get his one black. 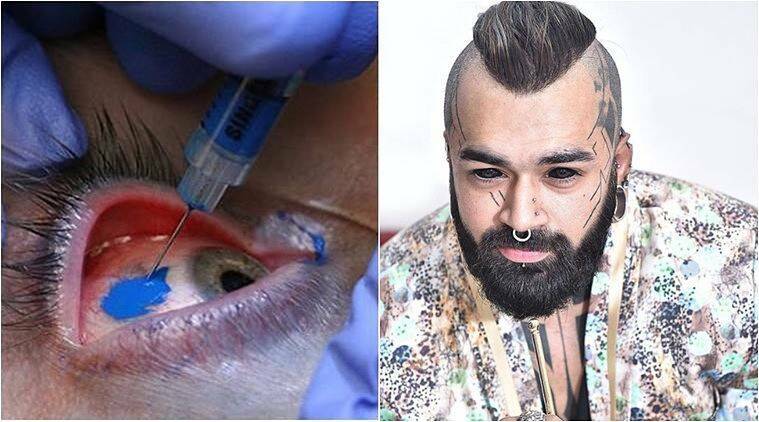 A tattoo artist based out of Delhi, Karan King, is making news for claiming to be the first Indian to have his eyeballs inked. He seems to be liking his new tattoo and is in fact, flaunting it, if his Instagram photos are anything to go by. Talking to indianexpress.com, the 28-year-old tattoo and piercing artist said he went ahead with his decision because he wanted to. “I was about to be disliked for my accomplishment anyway and still I did it because I wanted it. My eyes, my happiness, my life,” he said. While his attempt at getting inked was successful, he was well aware of the major risks involved in what he was signing up for. “I knew I might lose my eyesight but since I did my homework I went ahead with it. I was so hungry for it that I wanted it at any cost,” he said. It was however, not very long ago that a Canadian model Catt Gallinger made news after her scleral tattoo went wrong and started shedding purple tears. Her botched up tattoo almost took her eye and the model is now on a mission to educate people to calculate the risks before colouring their eyeballs. The process of getting a coloured eye tattoo involves injecting your eyes with ink and turning them into colourful orbs. Though the tattoo doesn’t seem to be for the faint-hearted, fanatics are trying out everything, starting from purple and red to orange and green. Here are pictures of some of them. While getting a scleral tattoo might sound fantastical to some and scary to others, there is always a list of dos and don’ts to know before taking the step. Here are important things to keep in mind before taking the plunge. * When the idea of colouring the eye first came out, some tattoo artists went with a traditional ‘hand-poked’ method, which the artists used before the electrical machines had come up. The method anyway involved 40 pokes in the eye to get the colour in and was very cumbersome for the subject, not to mention horrifying with a person poking their finger in your eye 40 times, according to howstuffworks.com. * To ‘ease’ the discomfort of poking, a hypodermic needle was used which was a little improvement but still took some effort to find the right layer to put it into. According to the website, the immediate harms of the tattoo include blindness while the long-term consequences point to cataracts and infections. * Canadian model, Catt Gallinger’s tattoo went wrong due to the undiluted ink used for the tattoo, over injection and not enough/smaller injections sights, according to the model. Although her aftercare was good, these misses may now cost her an eye. Gallinger had to go on eye drops and steroids to reduce her internal swelling and bring her eye back to normal size. So how can you take care of the eyes if you’re feeling adventurous enough to get the tattoo? Talking to indianexpress.com, celebrity tattoo artist Vikas Malani said, “Eye drops should be used just to make sure there is no irritation due to ink and one should wash the eyes with cold water regularly for a week.” He also advised staying away from heat, going out in the sun and to avoid doing anything that strains the eyes.